Christmas means something different to everyone. For Christians, it's a celebration of the birth of Jesus Christ; for many people of no religion and those of other faiths, it's traditionally a time dedicated to the gathering and appreciation of family and friends. While some envision Christmas as a time of shining snow and keeping warm, to others (like myself) it's the scorch of summer and gathering in the backyard to enjoy a cold one in the sun. Truly, Christmas is a diverse holiday. Even Japan celebrates Christmas despite the populace being only 1-2% Christian, resulting in a rather different, albeit interesting, set of holiday traditions unlike that of Western countries. I'll be diving into not only how Japanese people spend Christmas, but the different representations of Christmas in popular culture between Japan and the West as well. First of all, although it is still sometimes celebrated between family and friends at parties, Christmas is widely considered to be more of a romantic holiday. In a way, Christmas is rather similar to Valentine's Day in the West: there is a negative social stigma associated with young women spending Christmas Eve alone, so much so that the term "used Christmas Cake" refers to an unmarried woman over 25 (though this has since fallen out of use due to the increasing average age for marriage). For couples, there's a lot of pressure to make Christmas Eve as romantic as possible and to give their partners a special gift from the heart. Neither Christmas Eve nor Christmas Day are considered national holidays like they are in the United States and other Western countries, meaning that Japanese workers will often find themselves working on these days. However, schools are usually closed on Christmas Day because the break for New Year's is close and December 23rd is a national holiday for The Emperor's Birthday (天皇誕生日 - Tennō tanjōbi), so the break usually starts on the 23rd. This setup may change next year since the current Emperor of Japan is abdicating in April, meaning The Emperor's Birthday will be moved to February 23rd starting in 2020 for the new Emperor Naruhito. Japanese people have a tradition of sending personal cards to friends and family, similar to the Western custom of Christmas cards, but these are for New Year's rather than Christmas. New Year's cards (年賀状 - Nengajō) are usually short and concise, only containing a few words and often a picture. Japanese New Year's cards hold two primary purposes: to inform faraway relatives or friends of important events in your life, and to give thanks to people who have done you a good deed in the past year. In fact, these cards are usually dropped off at the post office around Christmas time to ensure that they arrive by January 1st. However, much like Western Christmas cards, it is becoming far more common to simply send a text message instead. I may personally detest them, but Christmas cakes are an iconic staple of Western Christmas cuisine filled with dry fruit and can often be rather alcoholic (perfect for a gathering of relatives both young and old). In contrast, a Japanese Christmas cake is more of a strawberry shortcake as pictured above, and is usually shared between couples rather than among a family. Both cakes are a common supermarket and street market commodity, often picked up at the end of a shopping trip. Holiday shopping is almost no different than it is in the West; it's still a frantic occasion spent with friends and lots of money. Gifts, however, are a different story: couples are usually the only group to traditionally exchange presents for Christmas, typically on Christmas Eve as opposed to Christmas Day. Not only is it romantic, but it's also the perfect chance to get to know your partner better by giving presents. New Year's is the primary gift-giving period with the tradition of oseibo (お歳暮) and otoshidama (お年玉), which are an expression of gratitude for the year and a gift for the next. Since Japanese New Year's is a homegrown tradition in a country that is primarily Shintoist, it takes precedence over Christmas. In my hometown, there is an illuminated Christmas tree brought out every year and placed out on the bay, graciously standing at 25 metres (82 feet) tall. I remember a very special moment with an old friend of mine a few years ago down by the bay as we watched it light up and put on a show, creating a memorable experience. Illuminations are spectacular events to witness that can create fond memories with friends and family, and Japan is no different. 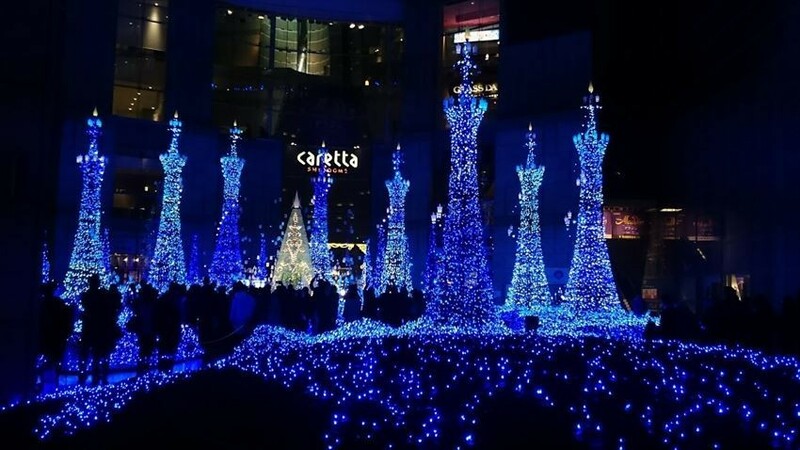 The most prominent illumination shows take place at Tokyo Midtown (Roppongi), Kobe’s Illuminarie, and Shinjuku Southern Terrace, as displayed above. Tokyo Disneyland and Disneysea are also popular Christmas show destinations. 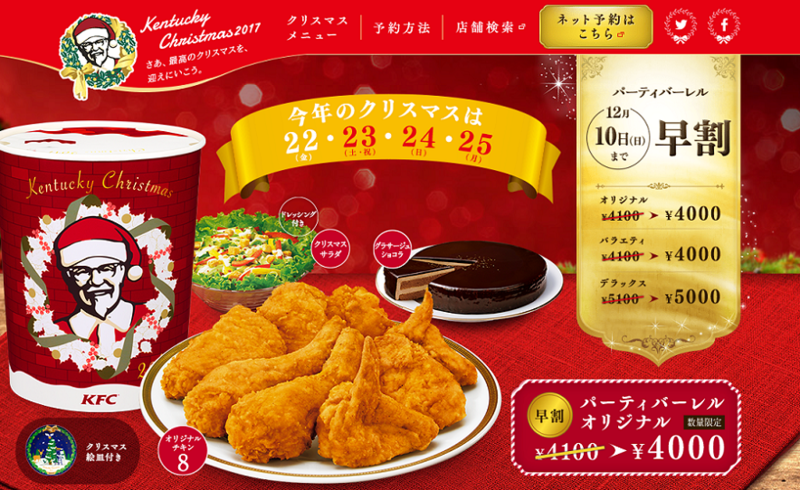 The most interesting Japanese Christmas tradition is the consumption of KFC—that's right, Kentucky Fried Chicken. Way back in 1974, KFC ran an aggressive marketing campaign in a crucial period when Western culture was beginning to truly flourish in Japan. Since whole chicken or turkeys were hard to obtain in Japan, many foreigners turned to KFC for Christmas. Realising this demand, KFC began marketing a Christmas meal deal that included chicken and wine. Since then, more varieties of Christmas meal deals have been released, becoming a household tradition that is still growing today. It's so popular that customers sometimes even order their Christmas feast months in advance! So the next time you're having KFC, remind yourself that you're eating Japanese Christmas food. Over time, many Hollywood Christmas movies have become household classics, including the likes of Elf, Miracle on 34th Street, The Polar Express, A Christmas Story, and more. Society-worn adults relearn the value of family, children experience the magic of Santa Claus, and Christmas often needs saving throughout the perennial production of holiday flicks. Hollywood Christmas movies also tend to reflect the consumerist nature of the holiday in conjunction with the spirit of Christmas, expressing the value of gifts for children (hence the need to save Christmas all the time). These joyful films hold a special place in the hearts of many people across the generations the tradition has spanned. 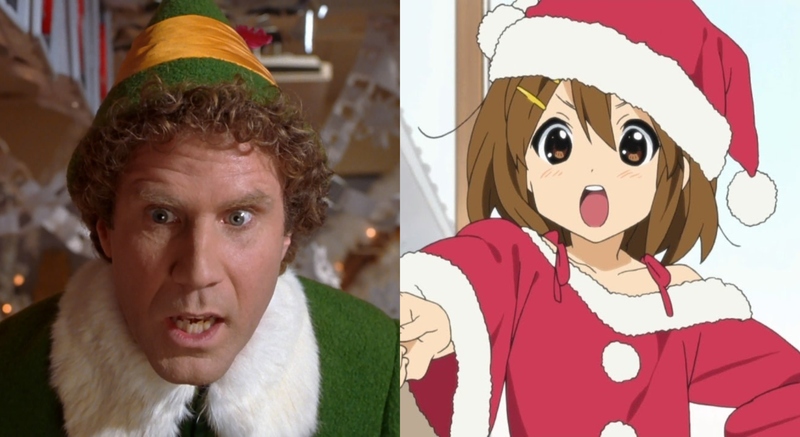 So how does anime differ in its presentation of Christmas? 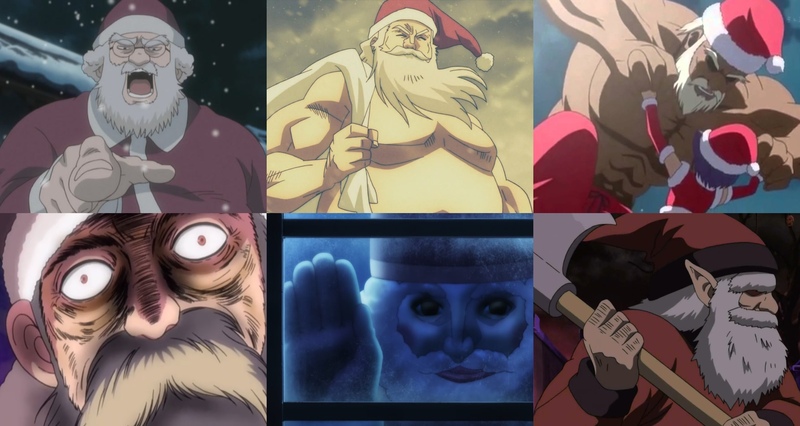 There are only a small number of anime wholly dedicated to the concept of Christmas, such as Tokyo Godfathers Itsudatte My Santa!, Santa Company, and an adaptation of Charles Dickens' A Christmas Carol (Machi Ichiban no Kechinbou). On the other hand, episodes or scenes dedicated to the holiday and central aspects of Japanese Christmas tradition are very common. You can find Takeo and Yamato spending time together as a couple in Ore Monogatari!! episode 17, Christmas cakes being sold in Saiki Kusuo no Ψ-nan 2 episode 1, legs of fried chicken being consumed in Keroro Gunsou episode 39, and Christmas illuminations in Angel Beats! episode 7. In fact, Hetalia: Axis Powers episode 31 explores the various worldwide traditions of Christmas through its many eccentric characters. However, perhaps the most important part of Christmas tales in any medium is its message: what is the meaning of Christmas? For anime and Japan as a whole, it's most often about taking the time to reaffirm precious relationships. Sometimes it's finding or strengthening love, sometimes it's having fun with treasured friends and family, sometimes it's working through the pain to move forward. 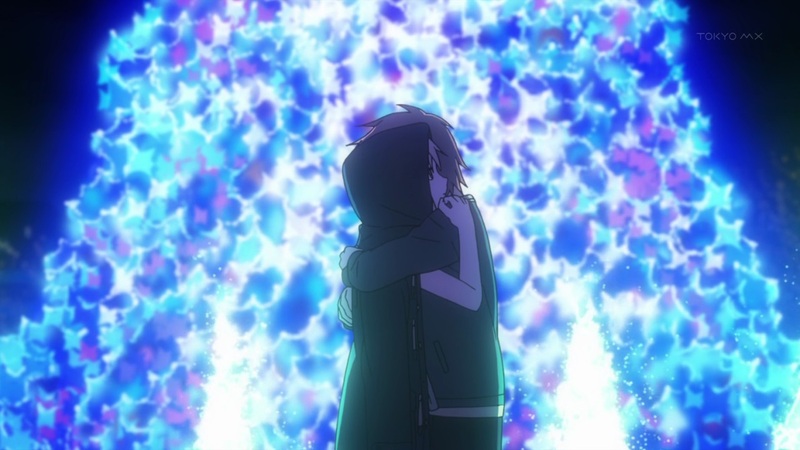 Sakurasou no Pet na Kanojo episode 14 opens with how the residents of Sakurasou feel about their love interests; Mashiro and Sorata come to understand and reconnect with each other; Misaki attempts a new step in her relationship with Jun. K-On! episode 7 explores the adorable relationship between Yui and her sister Ui at Christmas time, particularly through their gifts to each other near the end. In Toradora! episode 19, Taiga shares a special moment with Ryuuji and comes to realise just how much he means to her. Needless to say, anime Christmas episodes are something special both for its characters and its audience. Whether you're eating Kentucky Fried Chicken with your significant other, attempting to slice a fruity Christmas cake into equal sizes for your extended family or just settling in for a night of Christmas movies, Christmas is a special time of year. Even if you don't celebrate Christmas, it's important to find the time to reaffirm the relationships you have with your friends, family, and romantic partner. I hope you have a very Merry Christmas, and a Happy New Year! If you'd like to know more about Japanese New Year's traditions, check out my article series about it starting here.